Wheeling, W.Va. –Nine organizations in or serving Belmont County have been awarded grants totaling over $49,000 through the Community Foundation for the Ohio Valley and its affiliate, the Smith-Goshen Rice Enrichment Fund. The Smith-Goshen Rice Enrichment Fund (SGREF) was created in 2013 by a group of landowners along with Rice Energy in Belmont County, Ohio to give back to the community. Grants are made from the SGREF to nonprofit organizations based in or serving Belmont County. 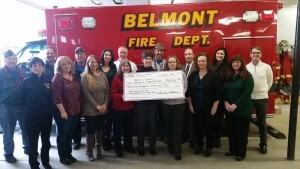 Grants were recently awarded to Belmont County District Library ($7,486) for children’s computers, Belmont Fire Department ($4,500) for SCBA bottles, Belmont County Military Veterans Museum ($1,000) for museum equipment and museum displays, Bridgeport Volunteer Fire and Emergency Department ($5,580) for gear project, Epworth Center ($1,000) for project manna, Ohio State University Extension ($2,500) for Belmont Ohio Walkability program, OR&W Fire District ($5,000) for new multi gas meters, The Judy Vincenzo Foundation ($2,500) for bridging the gap and caring for cancer project, and Tri-County Help Center ($8,500) for Peg’s House shelter expansion project. “We are grateful for the ongoing support of the members of the SGREF. The members of SGREF are a perfect example of what happens when folks who love and care about our communities collaborate for the benefit of us all. This grant award will assist families who seek shelter at Pegs House. Until you’ve witnessed the shock and fear in the eyes of victims and their children when they first enter shelter, you probably can’t fully comprehend how important this is. We, and the people we are able to serve, are immeasurably grateful.” –Cathy Campbell, Executive Director, Tri-County Help Center, Inc. Grants were also given to Barnesville Schools ($5,000) for technology equipment, Maynard Volunteer Fire Department ($1,000) and Barnesville Hospital received $5,000 of a $25,000 pledge for the Emergency Department. “We are honored to be a partner in the Smith-Goshen Rice Enrichment Fund’s development and ongoing growth. By supporting programs and organizations that promote public safety, education, leadership, and healthy lifestyle choices, the fund is making an active difference in the lives of our Belmont County neighbors.” -Kimberly Price, External Communications Manager, Rice Energy. Grant applications are accepted annually in fall for the Smith-Goshen Rice Enrichment Fund grant program. Projects should benefit Belmont County. Visit www.cfov.org/grants for more information.